This is my proposal for the Digital Humanities class at CUNY, The Graduate Center, spring 2015 semester. Abstract: “Mapping American Motherhood” is an interactive exhibit with digitized resources aimed at connecting people to valuable information within the disciplines of gender studies, motherhood, fatherhood, and family education. Its goal is to assist users in navigating content that is helpful to cultivating agency for the purpose of education, wellbeing, and advocacy. This will be the first collaboratively created project in the field of Mother Studies, and the first to propose integrated intellectual content that is delivered in accessible ways in a web-based platform. The project is premised on interactivity and solicits input from its users while providing them with solid theoretical content. It goes to the heart of the digital humanities mandate using text, music, video, articles, (and ultimately games), to archive, share, and manage a series of collections. 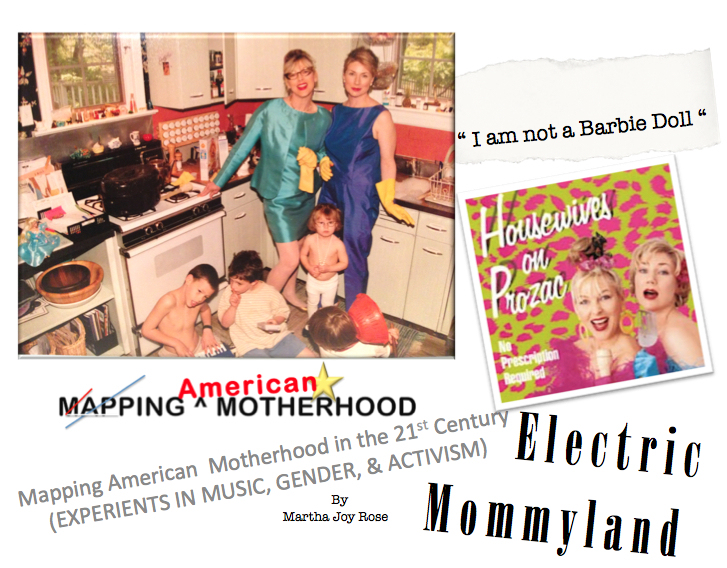 “Electric Mommyland” will be the first in the series of Mapping American Motherhood activites. The project is focused on digitizing, archiving and disseminating a collection of CD’s, taped sound bites, film clips, books, press stories, photographs, and portions of my thesis, in compelling and educational ways. The goal of the collection is to create a timeline that explores the social and cultural history of “mom rock” and its relationship to corresponding intellectual, literary, and academic theorizing happening simultaneously throughout the United States and Canada from the period of 1997-2007. This exhibit will connect with other organizations at the intersection of feminism, history, popular music, activism, and women in the academy. It encourages individuals and organizations to contribute photos artifacts and written reminiscences in order to facilitate a better understanding of current evolutions (or de-evolutions) of a modern American mother’s movement. I hope this project will lead to a clearer understanding of the past to better envision the future, while addressing issues of efficacy, which is something every educator is concerned with. This project was inspired in part by the Rave Archive and the Cold Spring Harbor Laboratory Oral History Collection. The Electric Mommyland team should include 1-3 members and be executed in two phases. The first phase includes digitizing materials. The second phase includes formatting those materials in an interactive online platform. Individuals selecting this project must be willing to fulfill various aspects of the roles assigned to them. During the 2015 DH praxis semester one team will begin to digitize music, text, photographs, and press, as well as identifying other organizations and individuals who might be interested in contributing photos artifacts and written reminiscences. I would welcome contributions from data mappers who might be interested lending their expertise to data sets assembled during this process and interpreting them. During the first phase, team members should acquaint themselves with the best resources for accomplishing the task at hand. These may include cameras, pro tools, i-movie editor, sound cloud, i-tunes, and photoshop. It will be important to identify and connect links to existing sources online as well. The online blog at ElectricMommyland.com will document these connections. During the second phase team members will determine the best web tools for building out the Electric Mommyland portion of the web site. We will then begin to measure and create social media campaigns around the initiative that link with other women’s organizations and oral history repositories to increase visibility and establish contact. We will also write press releases (to be published in a minimum of two online locations). The goal of this project is to explore new digital modes of public dissemination of women’s history and scholarship in the area of “Mother Studies.” It is my sense that this form of interactive learning; utilizing text, tools, and web-based technology will be creatively liberating and encourage new ways of working. I will explain each team member’s role in the “Staff” section of the presentation. There is a great divide between academia and the public sphere. If education makes our lives better, then more people need access to it. Digital Humanities projects can help solve the problem. Some of the most marginalized yet vital groups in society are mothers and caregivers. Information and support can be difficult to find and result in problems for those performing such labor. A few of those problems are: economic disempowerment, emotional isolation, physical harm (inside/outside the medical system, or their own partners), and psychological trauma. If the “net” shows us, as David Parry suggests in his article “Burn the Boats/Books” that “knowledge is about navigating, creating, and participating” (p. 2), then let freedom ring. Education can now move beyond the ivory tower and overcome economic barriers while still remaining relevant to those seeking the true immersive collegiate experience. In general terms we can fight gender inequity, classism, racism, and other major issues by circulating knowledge, and forging connections with vast bodies of intellectual resources that inspire us to actively participate in our own evolution as well as the evolution of knowledge itself. “Mapping American Motherhood” is an interactive exhibit with digitized resources aimed at connecting people to valuable information within the sphere of gender studies, American culture studies, sociology, feminist studies, the arts, motherhood, fatherhood, and family education. Its goal is to assist users in navigating resources that a) support them with useful information relevant to their lives and, b) assist them in cultivating agency by using social history to as a gateway to empowerment, wellbeing, and self-advocacy. This will be the first collaboratively created project in the field of Mother Studies, and the first to propose integrated intellectual content that is delivered in accessible ways in a web-based platform. The project is premised on interactivity and solicits input from its users while providing them with solid theoretical content. It goes to the heart of the digital humanities mandate using text, music, video, articles, (and ultimately games), to share and manage a series of collections. The first of this series, called Electric Mommyland is focused on digitizing, archiving and disseminating a collection of CD’s, taped sound bites, film clips, books, press stories, photographs, and portions of my thesis in compelling and educational ways. The goal of the collection is to create a timeline that explores the social and cultural history of “mom rock” and its relationship to corresponding intellectual, literary, and academic theorizing happening simultaneously throughout the United States and Canada from the period of 1997-2007. This is a social history and culture project that is forward facing, meaning its aim is to derive clearer understandings of history to better envision the future, while addressing issues of efficacy, which is something every family, feminist, and educator concerns themselves with. This project situates itself directly within the digital humanities. DH achieves relevance though its theory and practice at the intersection of technology and the humanities. DH does not simply digitize the humanities. Instead, through revolutionary applications of computational methodology it creates unique opportunities for connection and engagement. Digital Humanities is a “maker” project. Information is interpreted through its action. It is about “building things,” as suggested by Stephan Ramsay (Who’s In and Who’s Out), as cited by Mathew Gold in the online edition of Debates in the Digital Humanities. Therefore a project that builds outwards (through its internet instantiations) and inwards through its models of student and community involvement within the practice itself, must be doing something a) useful, and b) right. The problems of executing such endeavors can be daunting. According to Kathleen Fitzpatrick, author of Planned Obsolescence, rates of change can be “positively glacial.” She refers to the fact that institutional changes come slowly for big (really big) large public institutions (p. 9). How then to move forward with the kinds of change that bridges the gap between the ivory tower and the general public which is emphatically what this project aspires to do? How to best disseminate information in appealing ways and situate that information at intersection of academic excellence and social relevance? I argue that technological innovations, which are widely available for use in compelling ways, must be incorporated into current systems of education and also into museum work. A few of these ways are MOOCS, data mapping, and educational exhibits like Electric Mommyland. In September 2014, the Oral History Association highlighted stories of academics as activists who have played crucial roles in local, national, and international movements in recent history, thus acknowledging the contributions academia has to oral histories in general. More specifically universities and museums must continue to seek ways to interface with the public through practical and material innovations that have a direct impact on the larger community In the words of Kathleen Fitzpatrick, work must continue that establishes “communication environments that generate rich scholarly discussions well into the future” (p. 196). As universities and museums continue to seek ways to collect and disseminate information digitally, specifically within digital humanities departments, which must serve as the pioneers for such engagement, it is paramount to foster a conversation between people inside the academy and those outside the academy. Projects spear-headed by Columbia University, Smith College, and the New York Public Library, serve as examples for the ways in which the Digital Humanities, history, human beings, and their communities intersect to highlight individuals actively pursuing passionate intellectual, activist, artistic, and social endeavors, framing them in ways that they are situated within a particular time and place. Electric Mommyland will kick off a semester-long effort focused on utilizing innovative technology for three major purposes: 1) to create a more effective interface between sociologists, musicologists, feminists, historians and students conducting research and writing on motherhood to individuals who crave access to information, 2) to provide compelling online exhibits that engage users by identifying important social issues in ways that are provocative, but not alienating, 3) to provide an archive for the “Mom Rock” platform as a gateway to more rigorous engagement with theoretical information within the Mapping American Motherhood Project. This goal of this activity hopes to solve two distinct problems— Information and support for mothers and caregivers can be difficult to access, and information about them (that is not simply trying to sell them something) results in problems for those performing such labor and those interpreting that labor. Secondly, the exhibit posits a rebuttal to the assumption that the rudimentary, base, and physical labor of birthing and raising children is too mundane for intellectual or artistic occupation. In lieu of “how to” guides and manuals geared towards the mechanics of the processes of birthing and caregiving, Mapping American Motherhood aims to engage minds in the direction of an intellectual pursuit and connection to the interdisciplinary practice of Mother Studies. As Digital Humanities moves forward it must continue to “discover, edit, archive, interpret, and understand our cultural heritage” (p. 32, Steve Jones, Eversion). Likewise, Mapping American Motherhood will embrace this credo wholeheartedly by acknowledging that technology is everywhere. It is shaping its users as it is being shaped, future-forward initiatives must embrace the exchange as a practical and essential tool for ongoing educational theory and practice within places of learning. Institutions must, and will face outwards towards its users and energize the community, which will reciprocate in kind. There are currently many outstanding projects focused on bringing the humanities to life digitally that utilize cutting edge technology to disseminate information and engage people. These can easily be found through search engines that result in a plethora of findings. The Oral History Online Project boasts indexing to more than 2,700 collections of oral history in English from around the world. At the same time, universities, libraries, and museums are employing techniques that include “creative design, meaning-making, data curating, interaction and dissemination of scholarship,” which is pointed out in the chapter, “The Humanities in the Digital Humanities” as part of Hypercities (p. 20). With literally thousands of digitally inspired humanities examples to choose from, this project must have justification that both makes sense, and is helpful within the larger scheme of the burgeoning young field of Mother Studies and what it hopes to accomplish. In this section I will briefly explore a bit of the larger theoretical, historical, and social context of DH itself and attempt to explain how Electric Mommyland sets a stage for larger-scoped projects like the Mapping American Motherhood series that future generations of students may access, engage with, and expand upon. To do this I refer to aspects of contemporary scholarship regarding these matters. Howard L. Sachs begins his treatise “Why Do Oral History?” by asking the question “what do you hope to accomplish?” The easy answer, other than hoping to compete with Columbia University (CCOH) which holds in excess of 8,000 interviews is, that when done right, an oral history archive can capture a moment in history, and the essence of the people who were present for such things. Championed by great leaders, repositories can awe and inspire those who encounter them. I am remembering my first semester in graduate school and studies focused on Rosiland Franklin. Research led me to the Cold Spring Harbor Oral History Project. Once there I was able to access an interview with James Watson, the great nemesis to Franklin’s glory. After reading several books on the subject, I was transfixed by the ability to access photos, audio, transcripts, and opinion pieces within the Cold Spring Harbor Laboratory’s online portal. It was a treasure of a find, and in no small way sent me sideling over to the Digital Humanities Department when the time came to formulate a degreed area of study. Steven Jones writes of e-verting out with contemporary technologies, and indeed that was exactly my experience of having James Watson come to life, in my office, before my ears and eyes. The Cold Spring website includes video, photographs, and transcriptions of interviews. Another example of this kind of project, and one that directly inspired me is the Rave Archive online. This music site was a hobby project intent on archiving the rave music of the 1990s. This music phenomenon was, as the article states a “cultural flash in the pan” yet the founders of Rave Archive had a massive collection of tunes they’d hoarded from that period. A 2011 BBC News story (which also quotes Stephen Brier, professor of GC DH praxis class 2014) highlights how the project is “just one example of how across the internet, dedicated hobbyists, tech entrepreneurs and professional archivists and historians are using the internet to preserve, catalogue, archive and distribute cultural ephemera.” In addition to music the site archives zines, and has an online forum. I envision the Electric Mommyland project to be similarly constructed. More robust visual displays, and a concerted effort to invite users to participate with the material will elaborate on such instantiations. When I began this project, I posted one of my class papers on the web in an effort to “walk the DH walk” and “talk the talk.” It felt right. Recent developments in collaborative publishing, which Kathleen Fitzpatrick bases her book Planned Obsolescence on, advocate for more peer review of projects that offer “sharp, thoughtful criticism intended to help make project[s] better” (p. 190). Therefore, I created a response submission form within the paper and then posted a link to my social media channels. Academics, friends, and laypeople have been responding. The comments confirm this was the correct way to proceed. The feedback is insightful and demonstrates that the website is creating the kind of interplay DH claims is essential. The Digital Humanities are currently alive with the call for everything from big data projects (see Lev Manovich), to trend visualization (see Franco Moretti’s, Graphs, Maps, and Trees) to Stephen Ramsay, and Geoffrey Rockwell’s call towards a “materialist epsitomology” that “defends building as a distinct form of scholarly endeavor” (p. 2 “Developing Things: Notes toward an Epistemology of Building in the Digital Humanities”). If as Ramsey, Rockwell, and Manovich go on to espouse that a “prototype is a theory” then the things we build within the Digital Humanities constitute the essence of all that DH is. Therefore I argue that this project must be done: thoughtfully, with a clear methodology and a theory of purpose, and the project must be shaped by the people who interact with it. The methodology to which I refer is the systematic building out of the project, the notes detailing the process of building, and the incorporating of external resources within the project, much like Debates in The Digital Humanities does in textual form. Finally, I hope that this project will receive support from my professors who would sanction its creation, the DH Department, its fellows, and those who might join in a class project. Because this is not simply an online portal, but a thesis project, it will be reviewed, scrutinized, and evaluated within the academic framework. I intend to not only to submit a traditional thesis, but to see it move the DH agenda forward. Examples of the kind of work for which I am arguing are plentiful. But, many such examples, while serving to capture content, do not necessarily provoke the imagination. In other words, there are many inferior examples of social history that lack technical astuteness, and appear to either simply use blog formats to post YouTube video, or photos that wander somewhat aimlessly around a subject, as if the point is merely to post something online. Several factors must be determined at the outset, and these include but are not limited to: What is the point of the project? What makes it compelling? Can users interact with the platform? What will raise the bar on innovation? For the purposes of Electric Mommyland I advocate for a focus on the emerging field of Mother Studies itself, with an eye on how each segment will fit into the broader whole, as well as calling on the compelling aspects of the project to draw participants to the interaction. I have identified the following DH examples currently posted on the Graduate Center’s digital humanities website. They include inspiration from the following projects: Nancy K. Miller, What They Saved. This is a simple WordPress platform using photographs and text; Cynthia Tobar, and the “Welfare Rights Initiative: Digital Oral History Project” demonstrates oral and pictorial possibilities within a WordPress platform, Matthew Gold’s, Debates in the Digital Humanities, and its innovative use of collaborative text in an free-open sourced platform and “The Open Music History Project.” Finally, Naomi Barrettara, “Musicology” project also help to guide this practitioner in the direction of building out text for future projects that will provide assessable learning tools for further discourse on the developing field of Mother Studies. Upload CFP to the site end of February, drawing academics to the project and asking for feedback on the site. The CFP is for “Mothers, Mothering, and Music,” for Demeter Press. Publish date 2016. I am the editor of this publication for the currently only existing publisher for work in the area of feminist mothering. Determine the best WordPress site to create galleries, include sound, and serve as content back-end to the project. This may require upgrading to a paid site. Complete Thesis and submit to Barbara Katz Rothman for approval. Publish an announcement in a minimum of two online academic publications. Social media to solicit participation from individuals not in the academy, and request people send digital artifacts, text, stories from others in the arts, academia, and mom rock movement to me. Post 10 digital artifacts, text, stories from others in the arts, academia, and mom rock movement online on the website. Project Manager: Post project documentation online at the “Mapping Motherhood” website, and file regular reports, add current and relevant stories from the news and academia to the blog area/manage Twitter, Facebook, Instagram, DH blog reports, write and publish a minimum of two press releases, make sure project is on task, conduct any research/problem solving that needs to be done. Manage responses to project, and facilitate transcription of any oral histories or sound bites to PDF/word document. Digital Coordinator: Image collection and digitization, audio digitizing, film editing, photoshop or word document image editing. Web Coordinator: Website management. Determine best platform. Experiment with it. Manage online layout, and upload content. Set up response boxes on the website, and download responses. Identify links that lead to other resources that will benefit users engaging with the project or lead to other relevant information that might be helpful to people navigating the site. *(Bonus) Determine data mapping parameters and goals: Collect data/clean data/map data, upload data and data images to website. Depending on grant applications and funding, projects could be built out to a degree that would rival the New York Times Digital Storytelling platform, which would be amazing. Mapping American Motherhood is intended to serve as a repository for projects within the newly emerging area of Mother Studies and the Digital Humanities. The first of these projects, Electric Mommyland; A Sociological History Through Auto-Ethnographical Art and Music Performance Towards a Deeper Understanding of Everything Mom is an interactive exhibit with digitized resources aimed at connecting people to valuable information within the sphere of gender studies, American culture studies, sociology, feminist studies, the arts, motherhood, fatherhood, and family education. The goal of the collection is to create a timeline that explores the social and cultural history of “mom rock” and its relationship to corresponding intellectual, literary, and academic theorizing happening simultaneously throughout the United States and Canada from the period of 1997-2007. Users navigating resources will find links that a) support them with useful information relevant to their experience, b) assist them in cultivating agency by using social history to as a gateway to empowerment, wellbeing, and self-advocacy. Subsequent phases of the project include, but are not limited to, publication of Motherhood, Mothering, and Music, for which I am the editor, due out in 2016 (Print version, Demeter Press). I aim to propose a Digital Version of the book be made available too (there are currently no plans for this), and I will propose to facilitate that process. Additionally I am at work on a collaborative text book tentatively titled Introduction to Mother Studies which will be published online in open source format, and will solicit interactive responses, notes, and edits much like the Debates In Digital Humanities project, from within this new area of academia. Projects like this will draw more people into the university from a currently untapped segment of the population. I have already heard from one author/artist who is at work on an art project about motherhood. Her workshops with mothers across the country produce images about motherhood that could be shared in future initiatives of the Mapping American Motherhood project online. Story of Mum.com, out of England is another group I’ve worked with in the past (2014). They have a robust website filled with compelling images. I also think games would be a wonderful way to entice future students. Anecdotally speaking, mothers, who are performing mothering work, have expressed interest in studying this subject. Some experimental programs have taken place– undergraduate, as well as graduate students who are not mothers, have participated. I taught four semesters of classes to male and female students age 17-50 at the Museum of Motherhood in NYC from 2012-2014. Online classes implemented at the museum in 2012 and 2013 were part of a pilot program between M.O.M. and Minnesota State University. Two course offerings, one in “Work Life Balance” and another in “Introduction To Feminist Mothering” were well attended in a MOOC platform. Currently Mother Matrix classes and Mediating Motherhood classes are being taught at both Columbia Teachers College, and Marymount Manhattan College. CUNY’s own Barbara Katz Rothman has been teaching Maternal Health and Sociology classes since the 1990s. By bringing this subject into the university, within the framework of Digital Humanities, many more may be impacted in the future. My Thesis argues for exactly this point. My degree at the Graduate Center, a combined DH and Women’s and Gender Study, Individualized Program called Mother Studies, paves the way for future students to embrace an educated and degreed tract within academia within this hereto under-investigated area of study. Dec. 10, 2014: I made a video for the final Digital Praxis class and posted it on YouTube. Dec. 15: I built a website for my paper “Electric Mommyland” for Hester Eisenstein’s class. Dec. 16: I realized this would be a good place to experiment with “Mapping American Motherhood” for DH. Dec. 17: I collected stats for the last 3 days. 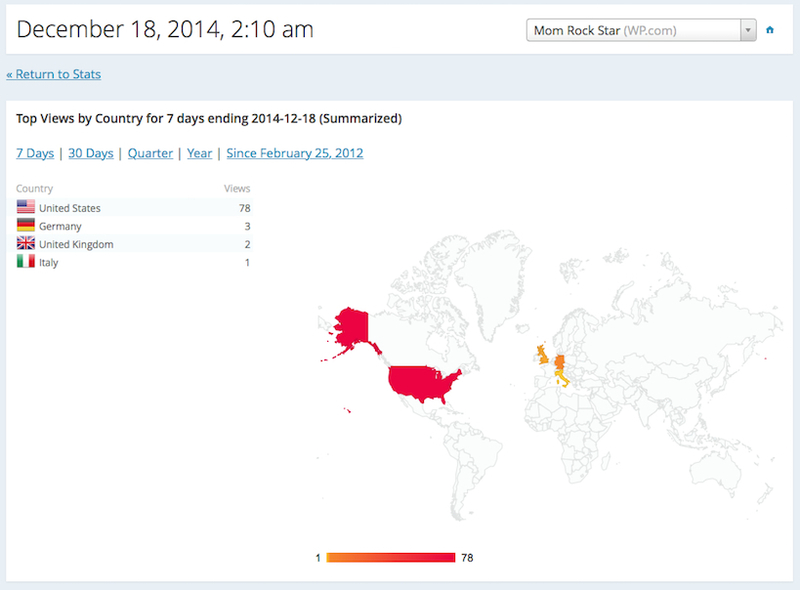 This map shows the stats for the new archive with four countries and 84 people reached. Another graph (below the map) shows social media reach (minus twitter) which was 614. These users were directly interacting with the material posted on the website. Tracking statistics like these will help quantify the number of people reached, and reflect some of the project’s engagement potential within the area of Mother Studies. The charts below reflect one week of digital dissemination.